What is the added value of Internet of Things? As Internet of Things applications are evolving, a lot of attention has been put on devices, sensors, connectivity and data gathering. However, the technology behind the IoT and the data it generates is outpacing our ability to consume, analyze, and drive value with it. This must change, organizations need to focus on the necessary data streams and their possible business enablers first … before implementing any IoT solution. Implementing an IoT solution that delivers the required data & insights does not start from a technical point of view. It kicks-off with a business analysis conducted by someone who has a frim understanding of the business at hand. Adding value can only be achieved if you have sufficient business knowledge. Without knowing what you want to measure you will never be able to define the how. Internet of Things analytics is a bit of a different animal from business as usual analytics or even Big Data analytics. 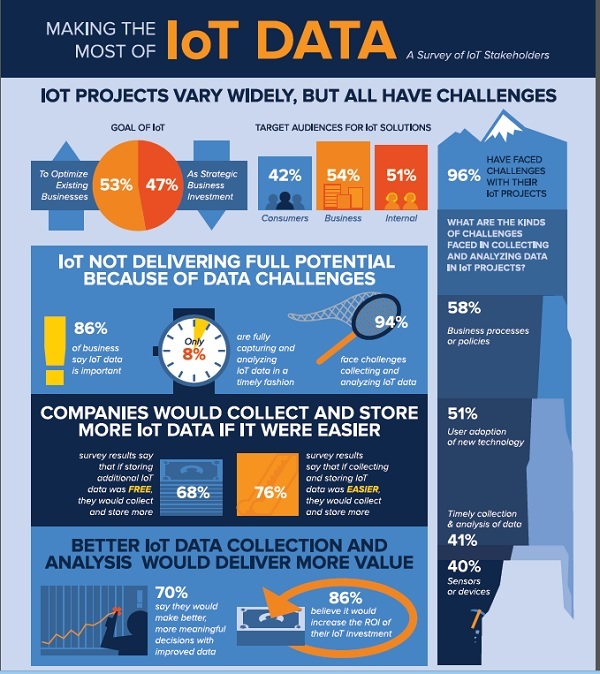 Data gathering from Internet of Things applications can vary depending on the use case. The number of sensors and volumes of data can range wildly depending on the application but at the core of the Internet of Things is a tremendous amount of structured data (machine data) coming in at a high velocity. Advanced data management and analytic infrastructure will be key for an IoT solution. Companies that are building the data management and analytic component of their IoT applications on a traditional, monolithic relational database infrastructure will quickly find that their large scale analytic requirements will break their legacy architectures and the costs to maintain their architecture will skyrocket.